At 4200 cm, It has the wingspan of a Boeing 737 but it carries no passengers – it also weighs less than a car. 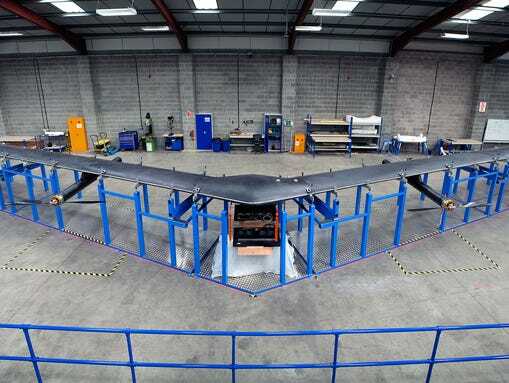 Named Aquila, the aircraft is the product of more than a year’s work at the social networking giant. Its function is to provide Internet access to the hundreds of millions of people who don’t have it in under-served parts of the world. Facebook aims to partner with carriers and other companies to provide connectivity, potentially at a lower cost than typical infrastructure like cell phone towers. Apart from this, Facebook as part of our Internet.org, made a breakthrough in laser communications technology. A new laser that can transmit data at 10 gigabits per second. That’s ten times faster than any previous system, and it can accurately connect with a point the size of a dime from more than 10 miles away. I’m excited to announce we’ve completed construction of our first full scale aircraft, Aquila, as part of our Internet.org effort. Aquila is a solar powered unmanned plane that beams down internet connectivity from the sky. It has the wingspan of a Boeing 737, but weighs less than a car and can stay in the air for months at a time. We’ve also made a breakthrough in laser communications technology. We’ve successfully tested a new laser that can transmit data at 10 gigabits per second. That’s ten times faster than any previous system, and it can accurately connect with a point the size of a dime from more than 10 miles away.This effort is important because 10% of the world’s population lives in areas without existing internet infrastructure. To affordably connect everyone, we need to build completely new technologies. Using aircraft to connect communities using lasers might seem like science fiction. But science fiction is often just science before its time. Over the coming months, we will test these systems in the real world and continue refining them so we can turn their promise into reality. Here’s a video showing the building of Aquila.